Designed by Nvidia. The smaller sibling of the Nvidia GeForce GTX 1080 Founder's Edition is called Nvidia GeForce GTX 1070 Founder's Edition. Powered by a Pascal GPU chip with 8 GB of GDDR5 VRAM, the card is supposed to prevail, especially in the lower high-end range. Learn in this review, whether Nvidia has actually achieved this, and where there might be weaknesses. 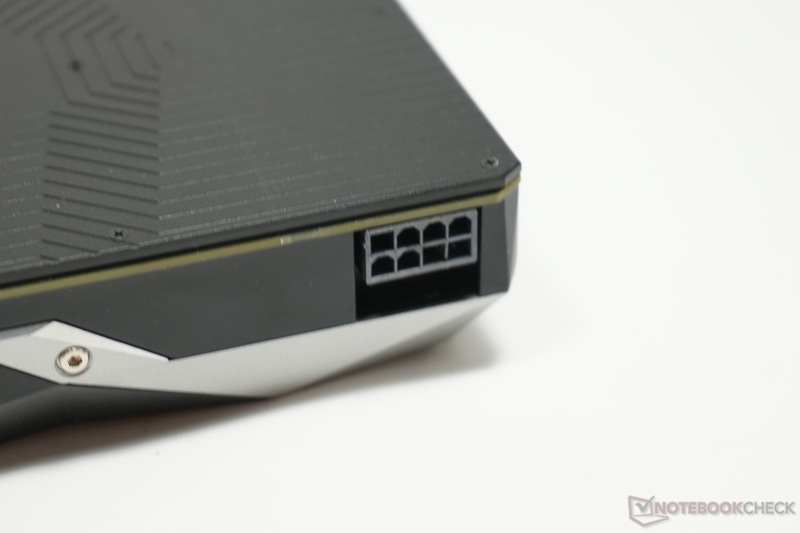 26.6 cm long (~10.5 in), 2 slots wide, 1x 8-pin power-in, and a 65 mm (~2.6 in) radial fan are the visible key features of the Nvidia GeForce GTX 1070 Founder's Edition. The cooling unit is more or less identical to that of the larger sibling. Only the label reveals which components are hidden behind it. Subjectively, the graphics card appears very high-end. The full cover back plate does not only contribute to this impression, but also protects the components. 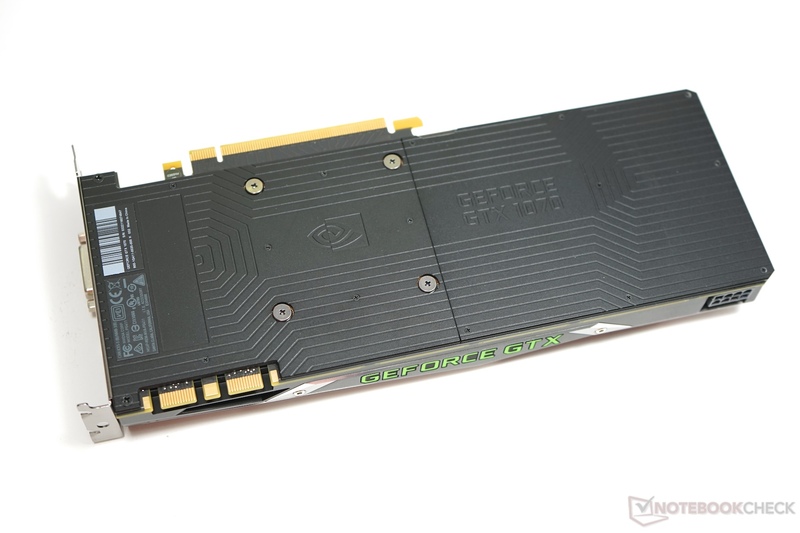 A green glowing "GEFORCE GTX" label decorates the side, which is an eye-catcher in cases with side window. 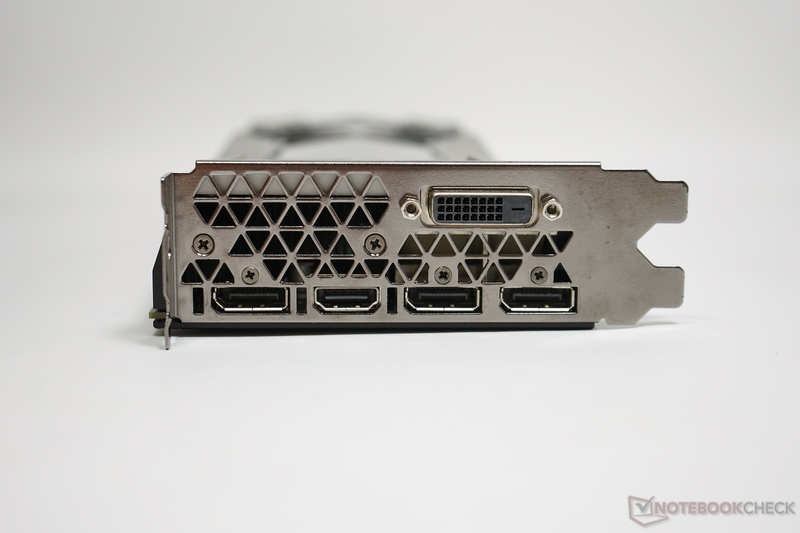 The Nvidia GeForce GTX 1070 Founder's Edition features a dual-link DVI port, an HDMI 2.0 port and three DisplayPorts on the external side. Inside, the performance can be increased by connecting a second graphics card via the SLI interface. However, it is necessary that games support SLI for a performance gain. The Nvidia GeForce GTX 1070 Founder's Edition is the reference model from Nvidia. This model carries the suffix "Founder's Edition". This graphics card will always be sold with standard clock rates and the same cooling system. The Nvidia GeForce GTX 1070 Founder's Edition features a base clock of 1506 MHz. Nvidia specifies a Turbo clock of 1683 MHz. Our GPUz render test reported a maximum clock of 1898 MHz. However, this is a theoretical value, which can only be reached for a few seconds when the GPU temperature is very low. Later in the tests, the clock frequency hovers at 1835 MHz. The reference card's clock rates are often significantly above 1700 MHz in the gaming benchmarks. The Nvidia GeForce GTX 1070 Founder's Edition ranks in just above the older GTX 980 Ti in the synthetic benchmarks. However, graphics cards of the GTX 980 Ti series, which are overclocked out-of-the-box, are able to outperform the GTX 1070 reference cards. 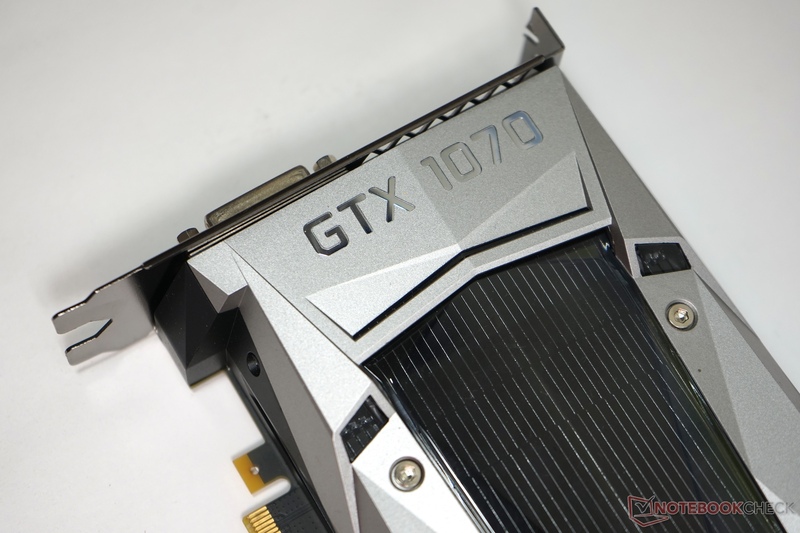 Nevertheless, the Nvidia GeForce GTX 1070 is the more modern graphics card and significantly more energy efficient than the predecessor generation. The GTX 1080 is somewhat faster than its smaller sibling by up to 24%. As with the GTX 1070 from MSI, the Founder's Edition also ensures decent performance. Most games run smoothly in 4K with high preset. Depending on game and preset, the GeForce GTX 1070 Founder's Edition is about 10% slower than the MSI card, which, however, is overclocked out-of-the-box. 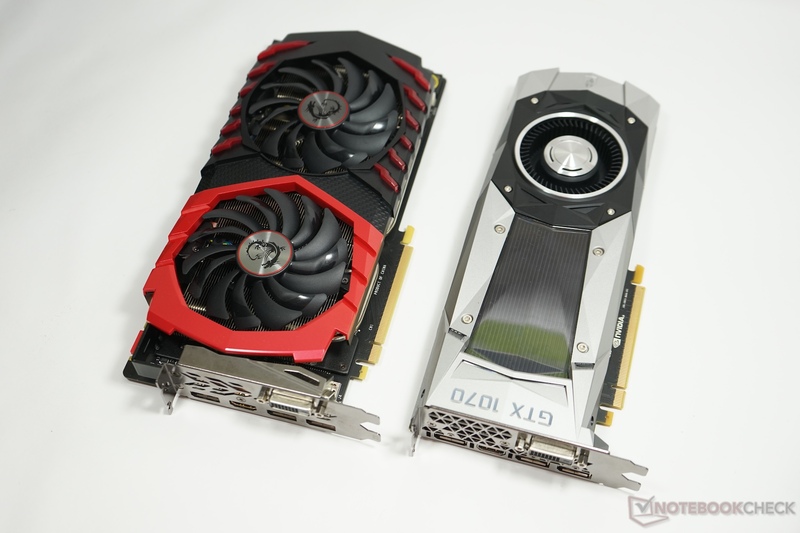 In terms of gaming performance, the two rivals, GeForce GTX 1070 Founder's Edition and GeForce GTX 980 Ti are on par. The performance of the GeForce GTX 1070 Founders' Edition remains stable when permanent load is applied. 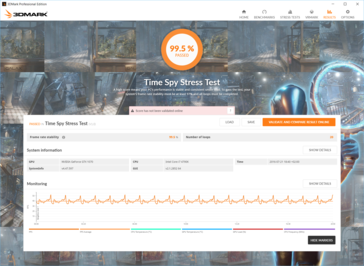 In the stress test which includes Futuremark in 3DMark (Time Spy DX12 test) our test card achieves a stability of very good 99.5% after 20 runs and still good 97.7% stability after another try. In view of the stress test results, a performance loss is unlikely during prolonged gaming sessions. 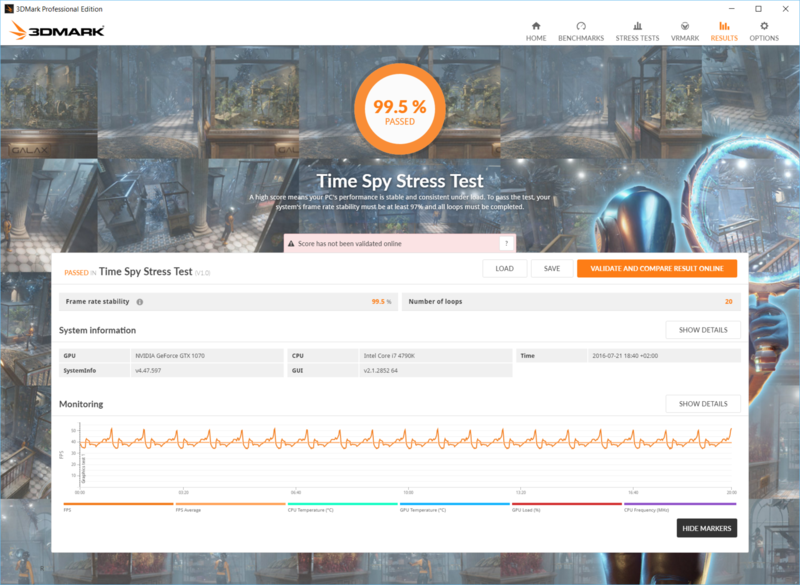 99.5% deviation in 20 runs of the DirectX 12 benchmark 3DMark Time Spy. 97.7% deviation in 20 runs of the DirectX 12 benchmark 3DMark Time Spy. The Nvidia GeForce GTX 1070 Founder's Edition features 8 Compute Units for general calculations, which can be addressed via OpenCL, DirectCompute, and CUDA. In terms of performance, the GTX 1070 Founders Edition ranks in behind its larger sibling. 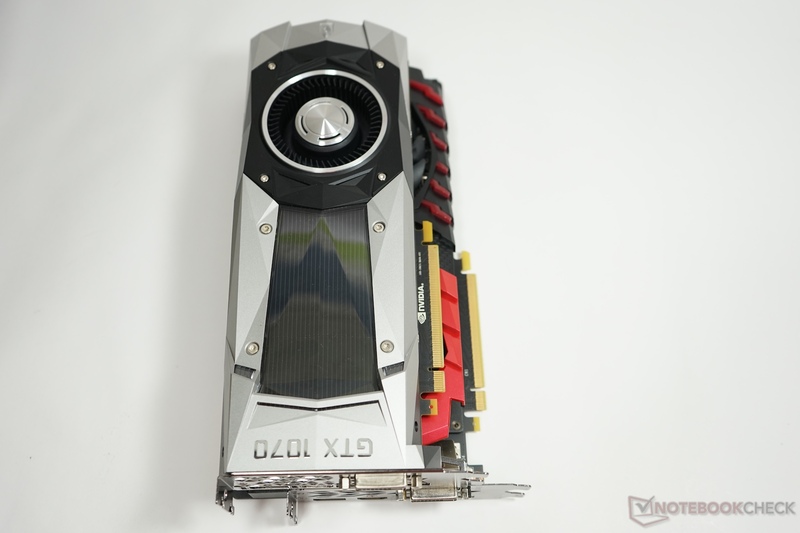 However, the GTX 980 Ti from Asus is leading in the LuxMark v2.0 Room Test. The ComputeMark v2.1 benchmark comes up with the familiar ranking again: GTX 1080 ahead of GTX 1070 and GTX 980Ti. The emissions of the Founder's Edition of the Nvidia GeForce GTX 1070 are almost identical to its larger sibling's. 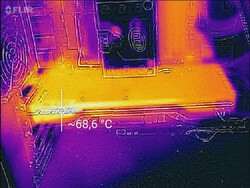 This is due to the identical cooling system, which blows warm air directly out of the case with a radial fan. Because of the GTX 1070's slightly lower performance, the fan does not need to run as fast as the GTX 1080's. This positively affects system noise. When idling, we could not record a noise. It takes a few minutes under permanent load before the fan control increases the rotation speed of the radial fan in order to cool the GPU. However, the load system noise is not annoying and remains well below 50 dB(A). 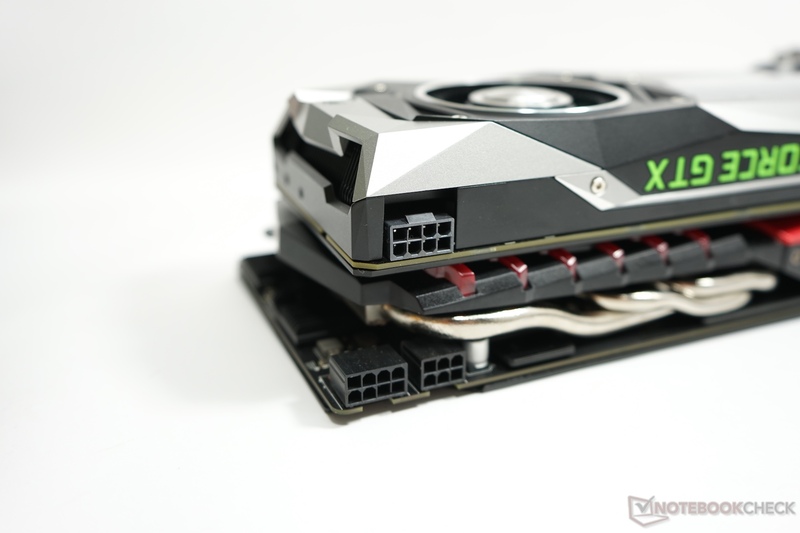 The Nvidia GeForce GTX also suffers from coil whining, when the frame rate exceeds 200 fps. However, there are no such problems when G-Sync is active. The power consumption of our test system is 66 watts (Desktop Windows 10, one 4K display connected via DisplayPort) without dedicated GPU. When idling, we measure 68 watts with GeForce GTX 1070. During the game “The Witcher 3” with Ultra preset we measured a power consumption of 243 watts. With the tool FurMark, we reach a maximum of 253 watts. Thus, the GeForce GTX 1070 needs about 40 watts less energy than the GeForce GTX 1080. Overall, Nvidia has significantly improved efficiency compared to the older Maxwell architecture. The GeForce GTX 1070 reference card from Nvidia carries the suffix Founder's Edition. It will also be available from popular graphics card manufacturers. However, this will not change the look or technology. The Pascal architecture could already convince us in the review of the Nvidia GeForce GTX 1080 Founder's Edition. With the smaller variant, Nvidia has a powerful graphics card, which indeed brings sufficient performance for running 4K games smoothly. Its price is upper mid-range. 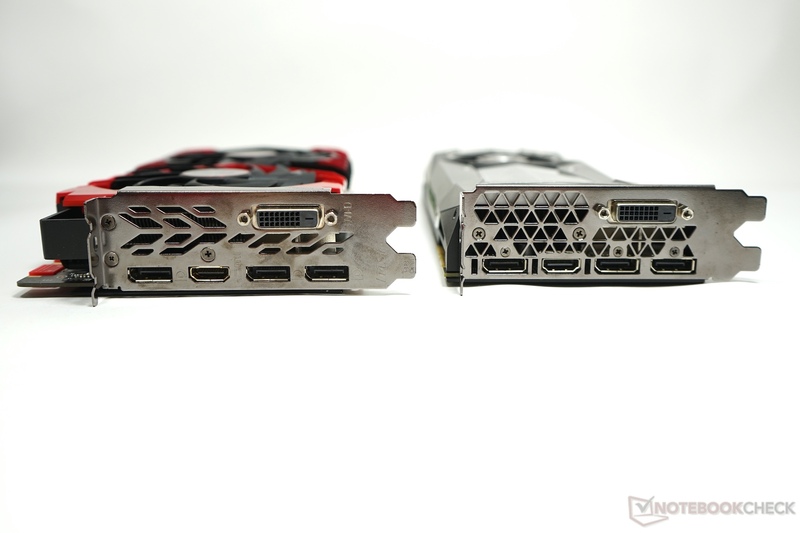 The performance of the graphics cards is similar to the GeForce GTX 980 Ti's. The Nvidia GeForce GTX 1070 Founder's Edition convinced us with decent performance and moderate power consumption (power consumption of the GPU: max. 150 watts). Those who want to buy a GeForce GTX 1070 with a custom design can expect even higher performance. Several renowned manufacturers equip their variants with two power ports. Thus, there are graphics cards, which are already overclocked ex-factory, which can be overclocked even higher, thanks to better power supply. The MSI GTX 1070 Gaming Z convinced e.g. with efficient and quiet cooling in our review, but falls slightly behind in efficiency.